The stakes have been raised for the Bay Bridge Series. Bragging rights are no longer the only thing on the line. 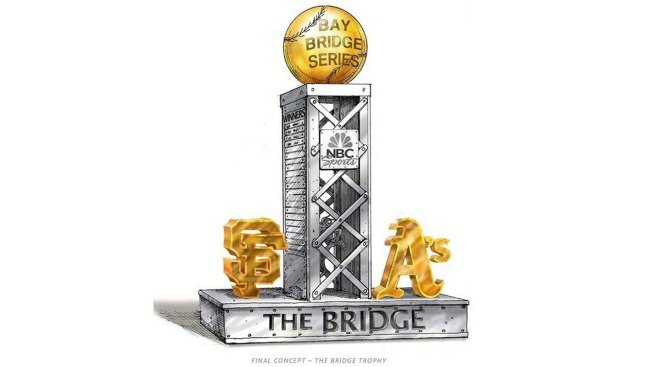 On Monday, prior to the game between the two teams at AT&T Park, the Giants and A's, in conjunction wtih NBC Sports Bay Area and California and Caltrans, unveiled "The Bridge" trophy that will be awarded to the winner of the regular season series. The trophy will be made from steel salvaged from the East Span of old Bay Bridge, will stand approximately 18 inches tall and will weigh 30 pounds. Once the Bay Bridge Series is clinched, the trophy will be awarded to the winning team. If the Bridge is won by the home team, the trophy will be awarded on the field right after the game. If the series-winning team is the road team, it will be presented in the clubhouse. "I can not think of a better symbol of our cross-bay rivalry than a trophy fabricated from the steel of the original San Francisco-Oakland Bay Bridge. The Giants-A's interleague games are always great fun for our fans and we are excited to get this season underway. We look forward to proudly displaying The Bridge at AT&T Park," said Giants President and CEO Larry Baer. The two teams will play six times during the 2018 season. From July 13-15, they will play at AT&T Park in San Francisco. They won't see each other again until after the All-Star Break when they play July 20-22. "The Bay Bridge series has always been exciting for our fans. What better way to enhance the friendly rivalry with our cross-town neighbors than with The Bridge trophy uniquely made from steel from the original San Francisco-Oakland Bay Bridge? We're excited to claim bragging rights in the Bay and hoist the trophy up at the Coliseum," said A's President Dave Kaval. The design and construction of The Bridge is a collaborative effort by Scientific Art Studio – whose work includes two popular features inside AT&T Park's Fan Lot, the Giant Glove and Coca-Cola Bottle Slide – and The Crucible, an Oakland-based industrial arts school. The Bridge is comprised of four components, several of which are interchangeable: a bronze Oakland Athletics logo, a bronze San Francisco Giants logo and a bronze baseball with an engraved "Bay Bridge Series" logo. They are attached to a T-base with a horizontal foundation in the form of a Bay Bridge bottom chord (or horizontal support beam) and an upright section, with an NBC Sports logo, derived from a vertical member of the old Bay Bridge truss. Winners of the Bay Bridge Series will be engraved on a plate attached to the side of the trophy. Each year, the arrangement of the trophy components depends on the outcome of the Bay Bridge Series. Should the A's win the series, the A's logo will be mounted on top of the trophy. Should the Giants win the series, the Giants logo will mounted on top of the trophy. Construction of The Bridge trophy is expected to be completed in June. The trophy will be approximately 18 inches tall and weigh approximately 30 lbs. "The Oakland A's and San Francisco Giants fans are among the most devoted and passionate fans in Major League Baseball," said Tom Stathakes, Senior Vice President and General Manager of NBC Sports Bay Area and NBC Sports California. "In addition to the spirited bragging rights among the fans, The Bridge will elevate the friendly cross-bay rivalry and raise the stakes during the teams' annual Bay Bridge Series." Giants and A's media services contributed to this report.